The Steering Committee (SC) of FELs of Europe (FoE) met in Paris at SOLEIL premises on 15 and 16 October 2018. Representatives of 11 FoE partners attended the SC meeting. 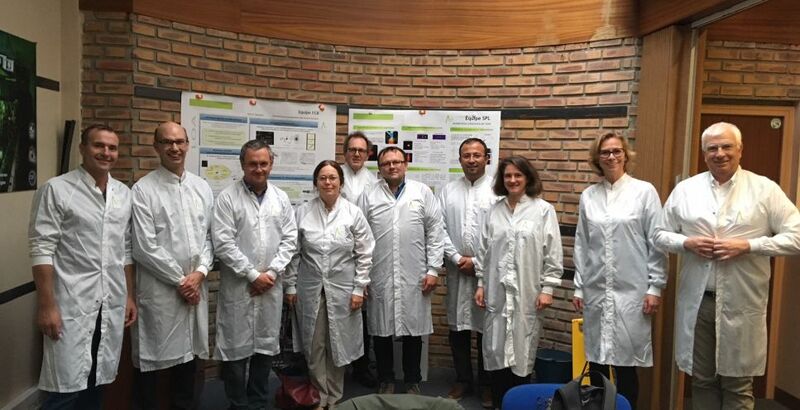 In his welcome address Jean Daillant, the Director of SOLEIL, gave a brief overview of the short pulses activities, in particular the slicing facility at SOLEIL and the COXINEL laboratory, both visited by the SC (see picture taken at COXINEL) together with CLIO. The meeting started with an interesting and extensive overview of the most recent activities and developments at the different partner facilities and laboratories. An impressive number of results, with a significant progress on the partner activities were presented. Information on three EU projects was then given, with updates on CALIPSOPlus, CompactLight and EUCALL. The latter ended last September, and FoE, network partner of EUCALL, signed the letter of intent to join the continuation of the collaboration, EUCALL Forum. The two conferences organized as FoE activities, SCIENCE@FELs 2018 in Stockholm and PhotonDiag 2018 in Hamburg both were very successful, with significant participation and interest shown by the respective scientific communities. The latest PR material of FoE was presented, as well as the roll-up banners which will be distributed to all partner facilities. It was also decided to print out the FoE Whitebook on Science with FELs. Special focus was given to LEAPS and the connection between FoE and LEAPS via the Strategy Group 2 on FELs. SG2 is presently being formed by members of the FoE SC as facility representatives and by five representatives of the users of FELs. The role of SG2 within LEAPS was extensively discussed by the SC. The host and date for the next meeting of the FoE SC was finally agreed: it will be held at Helmholtz-Zentrum Berlin - HZB on 25 and 26 of March 2019.